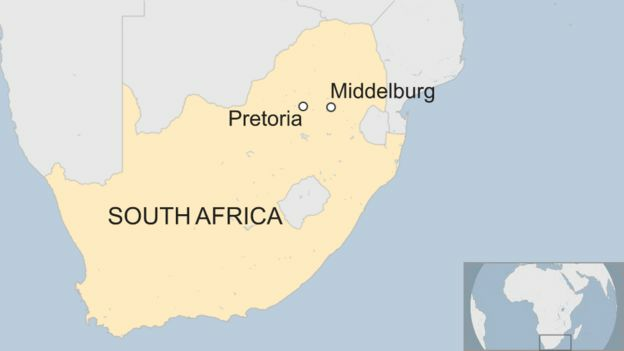 Six people have been killed by a gas explosion in an abandoned coal mine in South Africa, the national broadcaster is reporting. About 20 others are still trapped at the Gloria coal mine in Middelburg, east of the capital, Pretoria. A police spokesman said some people had gone into the mine to steal copper wires when a gas pipe exploded. Local media said rescue efforts were being hampered by dangerously high levels of toxic gas. “We’re still waiting for engines and generators to arrive to start putting oxygen into the ground”, local government official Speedy Mashilo told South Africa’s national broadcaster SABC. He said that engineers would join the rescue efforts by rigging up lighting in the mine shafts. The mine was closed after its owners, the Gupta brothers, found it difficult to continue doing business in South Africa following corruption allegations against them. South Africa’s former President Jacob Zuma has become embroiled in the allegations. Both parties have denied any wrongdoing. Mining accidents are common in South Africa. More than 80 fatalities were recorded in mines across the country in 2017. Last year, a power cut left 955 gold miners trapped underground for two days before they were eventually freed.